Mercedes-Benz Stadium officials discuss how their preparations before Super Bowl 53. The Super Bowl is a little more than a hundred days away from rolling into town. And with that comes added visitors, events, and increased security. 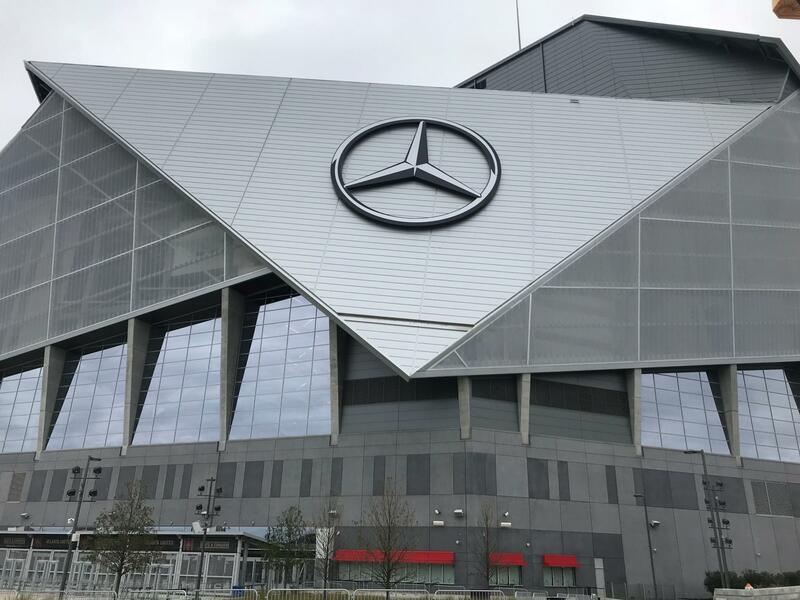 Mercedes-Benz Stadium and city of Atlanta officials met Friday to discuss preparations for the game and what residents, fans, and tourists can expect. The Super Bowl will draw the world’s eyes to Atlanta. The Minnesota StarTribune reported Super Bowl 52 drew some 125,000 people to the Twin Cities from out of state. That’s on top of the million who already live there that will take part in the Super Bowl events. A delegation from Atlanta went to Minneapolis during that time to gauge some of the things being done there, and this has really been in the works since then. One of the key things for city officials is that Atlanta has hosted its fair share of large events. This will be the third time Atlanta hosts the Super Bowl but the first since 2000. Before then the game was played here in 1994 but Atlanta police Chief Erika Shields says times have changes since then. "When we had these other events we didn't have drones,” Shields said speaking of new threats they must account for. “We didn't have people running over people with vehicles, we didn't have snipers shooting people from rooftops. There is a level of planning go into this event unlike any other thing this city has experienced." Earlier this year, the city hosted the College Football Playoff National Championship. That game presented a unique challenge as President Trump was in attendance and the city had to work with the Secret Service. Leading up to that a lot of complaints had been coming from people about long lines getting out and around the stadium. The stadium hadn’t even been open for a year before hosting that game, so that served as a learning point for people like the stadium’s General Manager Scott Jenkins. Mercedes-Benz Stadium is where Super Bowl 53 will be played. "We've done a number of things to free up some space to improve the directions that we send people,” Jenkins said. “In the last Falcons event we pretty much had free exits in 20 minutes." That game saw close to 70,000 people in attendance as the Falcons played the Tampa Bay Buccaneers. Jenkins said that crowd is a lot like what’s expected for the Super Bowl. He said they’ve also been working to identify which way most people like to go when they leave, which they anticipate will be east toward the city. Hosting the College Football National Championship also gave the city a dry run on how to handle winter weather if it hits during that time. Ice and rain were in the forecast and it was a rather cold and nasty day as people stood in line to get into the stadium. James Jackson, with Atlanta's Department of Public Works, said they are ready to take on any weather-related challenges. "Our operations has been quietly preparing for the event of a winter event and the winter season itself,” Jackson said. “We have acquired new equipment." Jackson said they've already had a couple of dry runs with the new equipment and there are more planned. He said they are focused on clearing roads and paths for both Super Bowl goers and everyday people trying to get to and from work. Atlanta’s Super Bowl host committee already has 10,000 volunteers ready, 1,800 of which will be at Hartsfield-Jackson Atlanta International Airport. The airport’s General Manager John Selden said arrival to the game will be staggered throughout the week but Sunday night and Monday morning after the game will be busiest. "For the security of it, TSA is bringing in extra staff,” Selden said. “There will be extra canine teams there." He said they are working with MARTA to make sure people can get to the airport on time. "We will be running 24 hours service beginning Friday morning all the way through the weekend,” said Jeffrey Parker, the transit authority’s CEO. Airport construction that could affect traveler’s and airport efficiency will also be halted leading up to the game. NFL officials seem to believe Atlanta is more than ready to handle the spotlight and stage. "We are where we need to be. In fact, we might even be a little bit further," said Jon Barker, vice president of NFL operations. City and stadium officials said their main point is to expect crowds but they believe they are equipped to handle them.